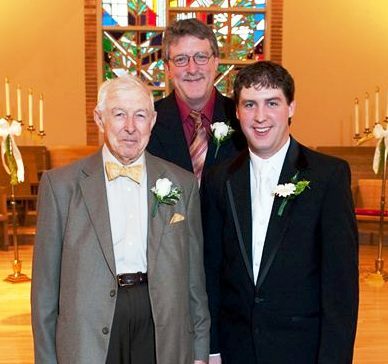 L to R: James Gilkeson, Jr., son David Gilkeson, and grandson James Matthew Gilkeson at Matt’s wedding a few years ago. Photo provided. Matt started off his reflections quoting from a podcast “S-Town” about John B. McLemore and an essay he wrote titled “A Worthwhile Life Defined” where McLemore used a little math to figure out how many hours the average person has in life to build a better world. Matt used those numbers to report that in his grandfather’s long life of 91 years, Jim spent 32 years sleeping; 40 years working and doing chores like mowing lawn; and 17 years doing the things that he truly loved and that make the world a better place. The things that we all live for, or should. Those were statistics for an average man. Matt felt his grandfather, however, was an extraordinary man, and talked about how his grandfather was actually able to squeeze more of the “truly loved” things into his life by merging them with various jobs he held, and volunteering for 50 years as a Boy Scout leader. He had a passion for helping young people with a variety of problems, working for improvements in the criminal justice system, and faithfully helping our church Clothes Closet for many years. As a Boy Scout, Matt was able to spend many hours with his grandfather that he may not have otherwise, in their shared love of all things scouting, and he also helped both grandparents with their Clothes Closet work. Matt talked about how, as is typical in many families, one parent or grandparent is more willing and open to bend the rules. If Jim was riding the grandchildren too hard about this issue or that, his grandmother, Em would call from the kitchen or wherever saying, “Jim, let them be! They’re kids.” Jim’s heart was in the right place—concerned for their safety—something he “preached” around our church building also. Matt’s take away and challenge that I carried with me from that memorial service was how much do I really work to help make the world a better place? Yes, there are still many people striving for that goal. We went to another memorial service recently for an elderly couple who died within four days of each other. So the family held a joint service, and the speakers emphasized how “doing for others” characterized both their lives in helping others. The father, Wilkie, was known for the beautiful dahlias he raised, and took great joy in sharing blooms with others. Each year at Christmas, his wife Shirley made something like 30 fresh coffee cakes and liberally bestowed them on friends and family. Among many other loving deeds and involvements. Rob, the retirement home chaplain who conducted the service, recalled how Wilkie had been the one to call out his personal gifts for being a pastor when he was just a teenager. Rob was helping to usher at church and Wilkie took him aside and asked, “Have you ever considered the ministry?” Rob said he had not previously considered that but after Wilkie raised the question, he did think about it a great deal. 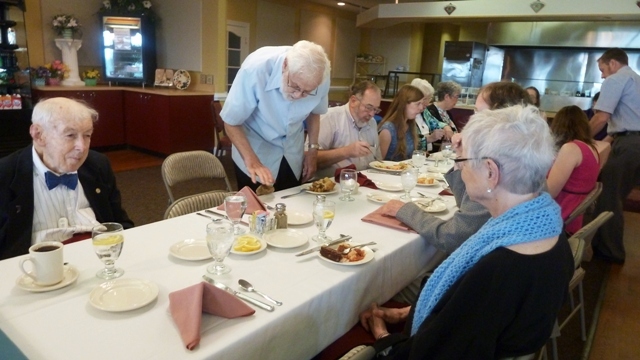 Rob today works among those who will never make him famous or rich—but enjoys and encourages the many gifts of those living in the retirement community where he serves. How are you spending your days? In a world where there is too much hate and fear, how are you helping the world become a better place? I’d love to hear from you at anotherwaymedia@yahoo.com or Another Way Media, Box 363, Singers Glen, Va. 22850. How am I helping the world become a better place? Like you, recording the kind and good in a virtual space much like yours. This morning, Cliff gave grandson Curtis an opportunity to mow our lawn, get paid, and pull a tithe from his earnings. It’s never too early to teach gratitude and generosity. Indeed! I love hearing your angles and additions here. So faithful! We started the same year of course. Have a wonderful day. Thank you so much, Beverly. The credit all goes to young Matt! I’m glad you’re sharing this with Trinity friends from the past.